I went through a major reading slump recently (damn you, Northanger Abbey! ), but now that I’ve recovered, I got to thinking about my favorite books growing up. I don’t think there’s ever been a time that I wasn’t reading anything, and it’s because of these books. I realized just how important children’s books and young adult literature are in bridging the gap between fairy tales and more serious books, so here I am, a lifelong reader because of the Marches, Katy Carr, the Chaletians and Nancy. This was the first real book my mom bought me. “Real”, because the books I remember reading up to this point were picture books and bible stories. When I got my copy of Little Women, I was awestruck by its beautiful hardcover and thick manuscript-like pages. 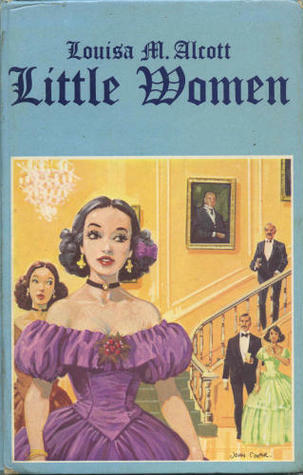 I remember that cover so vividly, with Meg dressed in a gorgeous purple ballgown as she attends Sally’s party. Sadly, I lost my book to a termite attack (*sniff*), but I’ve since bought another copy. Because no one ever really outgrows the March sisters and Marmee. Google did not fail me – I found the cover! How pretty is Meg? When my cousins, (who used to live next door to us) had to leave for the States, they had a huge garage sale. I remember scoring some Superman comics, my cousin’s Viewfinder that I’d been eyeing for years, and one Secret Seven book. I’m not a hundred per cent sure that this is the right title. All I remember is that it had a yellow cover (again with the memories of covers) and there was a tree house involved. Based on my research, this is the title that fits the bill. It wasn’t just a book either, it was more like a hardcover comic, with a recipe for Secret Seven cookies, exercises for identifying different types of trees (I remember poplars for some reason), and instructions for a DIY miniature garden (“use a mirror to serve as your pond”). Never mind the implausibility of children having that much independence and getting involved with thieves and criminals. I enjoyed the secret society’s adventures and reading about elevenses and orangeade. It was just a fun read! I can’t find the cover I have in mind on Google so I’m not sure if it’s my memory or the interwebs that failed me. So if anyone out there knows what I’m talking about, please send me a message so I know I’m not crazy! It was a glorious summer when my cousin lent me all her Little House books. I lined them all up on my mom’s shelf, and it was like a ceremony for me every time I would pick up the next book in the series. I was swept along with the Ingalls on their homesteading adventures. I remember reading words like “molasses” and “calico” for the first time. I didn’t know what they were, but they sounded amazing. They made their own bread! Put sawdust on the floor to keep the ice cool! And they bathed only once a week. Eww. But I enjoyed every page of it. I was so sure my cousin would give me all the books because I loved them so much. Alas, the summer ended and she came back for her books and I’m still not over that. I still read this to this day. One of the reasons I love it so much is its epistolary style. The story unfolds from the perspective of the heroine, Jerusha Abbott, because her benefactor – Daddy Long Legs – never writes back. But it’s not one-sided for all that. I also love that it’s set in college, so there are many anecdotes about school, lessons, and dorm life. I think the love story is sweet too, though I admit there have been times over the years when I have questioned if there wasn’t anything creepy about the way Jerusha and Daddy Long Legs’ relationship evolved. But it’s loads better than the movie. The sequel, Dear Enemy, is another epistolary novel. 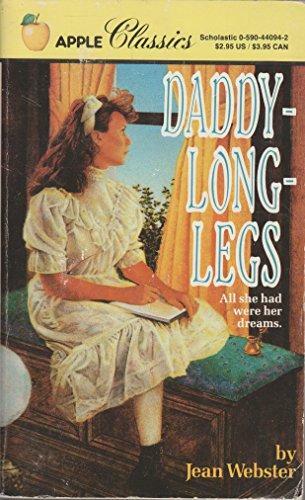 Jerusha’s college friend Sally McBride is the protagonist but though that’s a good read too, it has a more serious tone so I much prefer Daddy Long Legs. I think this is where my fixation with window seats came from. This is the sequel to What Katy Did, and there is no simpler reason for my listing this instead of the original than because this is the only book I have. Hah. I’ve since read about Katy’s exploits in the other books in the series (What Katy Did, What Katy Did at School), but this remains my favorite partly because of nostalgic reasons and partly because this is the book where Katy goes on a trip to Europe! My well-worn paperback copy (I still have it!) 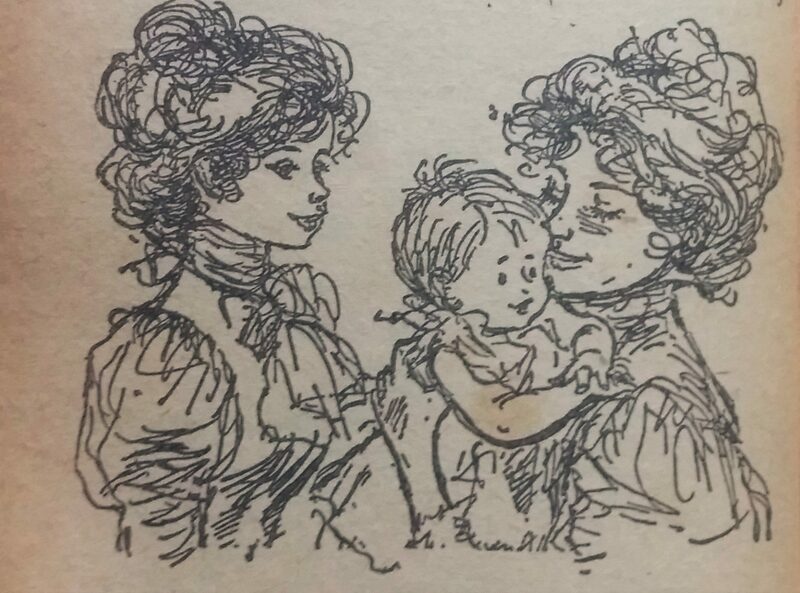 also has charming pencil illustrations that portray Katy as a Gibson girl with masses of hair and frilly gowns. My 12-year old and thirty-something selves are enamored. One of the charming drawings in my edition of ‘What Katy Did’. Look at Katy’s (on the left) masses of hair! And her frilly collar! This is the first book series I collected seriously. I never did buy all the books because not all of them were available, and also because they got too expensive! But it was a treat whenever I could buy a new book and add it to my bookshelf. As with most of the books I read, it started because of an old hand-me-down copy lying around the house. It was The Mystery of the Tolling Bell and all the words in the title were downright scary so I asked my mom and sister if they thought it would be too much for me. They said no, and so I started my Nancy Drew obsession. My godmother encouraged my reading too and when she found out this was my favorite, she bought me books for every special occasion. Paperpack Nancy Drews were issued when I got older and I tried them out for a while – Nancy was more modern and the covers were more teen-oriented – but they never had the same magic as the original series. Though when I reread some of them recently, I found myself being more annoyed by Nancy’s perfection than anything. She can basically do anything that a case calls for – whether it’s acting, waitressing, or cracking uncrackable codes. The books didn’t age well, but they sure were a memorable part of my childhood. Nothing much happens in this book, apart from Story Girl telling stories. That’s it. It’s summer in Prince Edward Island, and a group of cousins entertain themselves by spending all day in the orchard or fields. 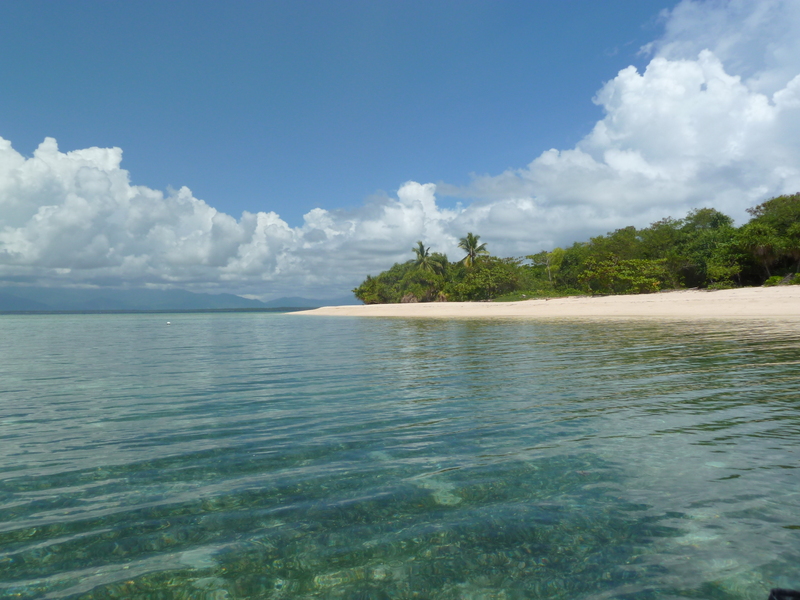 That’s all, and yet reading the book, I can practically smell the hay and feel the fresh breeze. 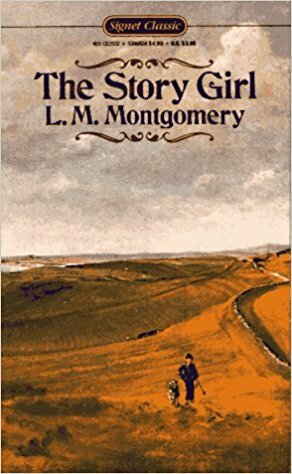 I love how Montgomery’s books are almost always set in PEI because it evokes such an idyllic atmosphere. I’ve never been there, but because of this book I always imagine it as postcard-perfect, with white picket fences and milk delivered in bottles. I’m probably wildly wrong, and I hope I don’t offend anyone from PEI who ever reads this. But to me it’s perfect because it brings back vivid memories of the first time I read this, in our school library during the last few lazy days of the school year with the sunlight slanting through the windows. I love this gloriously dated and old-fashioned series so much, I wrote a separate post about it. Suffice it to say that I gave away all my Nancy Drews but I never parted with my ten precious Chalet books. Who can forget the Wakefield twins, perfect Elizabeth and bad girl Jessica? They were the perfect California girls – tanned, blonde, and gorgeous. I felt so grown up when I “graduated” to Sweet Valley books. I never collected them because I had classmates who had most of the books so we just borrowed from these more fortunate ones. I had no problem with the borrowing rotation because I was always a fast reader and so ended up always first on the list. When the saga The Wakefields of Sweet Valley came out, we all went crazy because it was three times as thick as the regular books! I didn’t realize it at the time, but we had a book club going on. Looking back, I was really lucky that my classmates were nerds like me who, instead of giving me a hard time about being a bookworm, actually encouraged me to keep on reading. I’m just glad that I never finished the series because I think my innocence would have been shattered with what Liz and Jess end up doing. This is another one of those books that we all went crazy for in school. Here’s the story: a group of friends are involved in a crime but keep it secret. Except someone knows and starts sending them chain letters! Aaaahhhh! I can’t even look up the rest because it still scares the bejesus out of me. I think the reason it’s on this list is, apart from scaring me to death, it’s associated with great memories of my friends in school and all the G-rated fun we had, which at the time made us feel so cool – cakefights on the roof of a friend’s house, sneaking off to McDonald’s instead of going to school, and telling ghost stories at Girl Scout sleepovers. Good times. What are the books on your list? I loved little women too, anne of green gables, the lion the witch and the wardrobe, watership down (which probably wasnt that suitable for a kid, where the red fern grows. Ive been thinking a lot lately too about the books that grabbed my imagination when I was a kid, my 8 year old is now reading, like really reading and i want to share some of them with him. Wow, I don’t know if I would’ve understood To Kill A Mockingbird if I had read it in school. I think I would have missed so many layers. How did it seem different when your daughter read it? I’ll look up the year 1000! I’m always looking for new books to read 🙂 Thanks for dropping by! it was different in that , i detected the layers you spoke about and saw it more from the writers view , than reacting how the daughter would have. that’s always the amazing part of good literature to me , that there are so many perspectives to just one story told a certain way. I just came across your post because I recently blogged about Daddy-Long-Legs and wondered if there were any other fans out there. 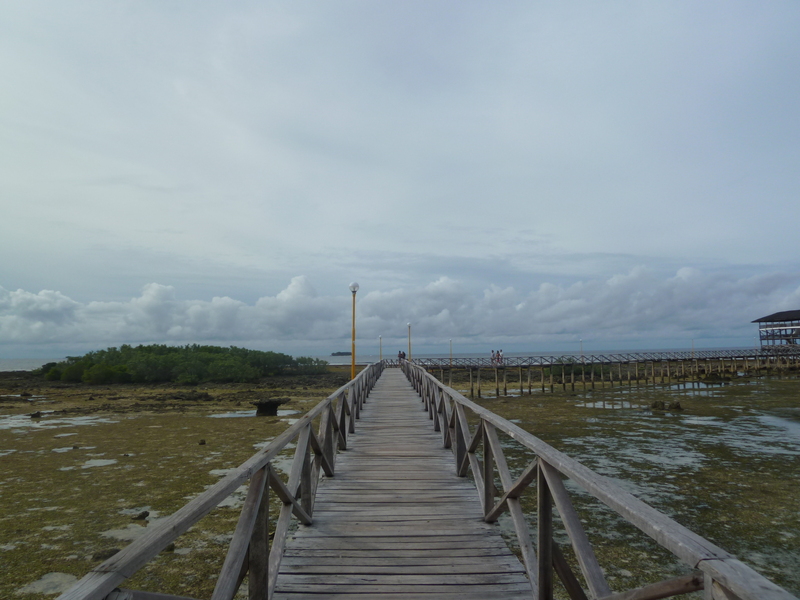 As I wrote on my post, I share your uneasiness about the ending. Other than that, it was as wonderful a read as I remembered from when I was twelve.